Dex is a playful and nimble kayak for day and weekend trips where high seas and surfs are more than welcome. A boat for those who appreciate contact in leans, edges and manoeuvres. Low volume. Low profile. Tight cockpit. Its responsiveness in combination with good tracking also makes a suitable mid/long-range kayak for smaller paddlers. 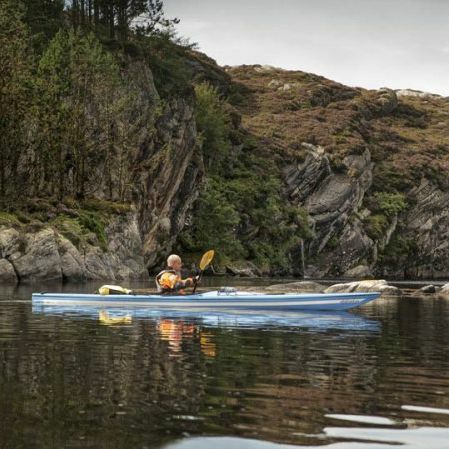 The optimal paddler weight for this kayak is 50-80kg. Carbon light (CL) hull of carbon fiber sandwich with diolen resin with a deck constructed in fiberglass and vinylester. Traditional lay-up is like the classic Skim yet with more reinforcement and therefore more rigid. Extra rigid is as expected even more rigid and nearly bomb proof. Carbon light has the same rigidness as the XR, but is by far the most lightweight lay up of the three.